Good morning Chairman Degnan, Director Foye. Commissioners. My compliments on the Vital Link Summit. It’s regional leadership in the best tradition of the Port Authority. Today I would address comments by Vice Chairman Rechler who noted that 230,000 people pass through the Port Authority Bus Terminal each day — and is projected to increase to 337,000 by 2040. Proposals to increase capacity include replacing the midtown bus terminal and building a third rail tunnel. Combined cost would be $30 billion, or $280,000 per traveler plus operational subsidies. Mr. Rechler tasked the Summit to imagine a transit system that would lure the young professionals we’ll need to maintain our status as the #1 Most Competitive City. And he correctly noted that millennials preferred mass transit to driving. Yes, but millennials prefer biking and walking even more. – A USPIRG study found that millennials took 4% more trips mass transit in 2009 than 2001; but 16% took more walking trips; and 27% more trips by bike. – In 2014, Pew Research observed that Chicago (#9 Most Competitive City), Washington DC (#14) and San Francisco (#18) all promoted cycling infrastructure to millennials who value the time and cost savings as well as the exercise and independence. – Recreational cyclists throughout the city who regard the GWB as an indispensable amenity, have significant representation in real estate, information technology, media and finance. London (#2), hosts 170,00 bike trips a day (one quarter of all trips) to its central business district. And Transport for London, frequently cited as the organizational model this region should emulate, is in the midst of a 10-year, $1.4 billion upgrade of the city’s cycling grid, including East-West and North-South superhighways to link the outer boroughs. 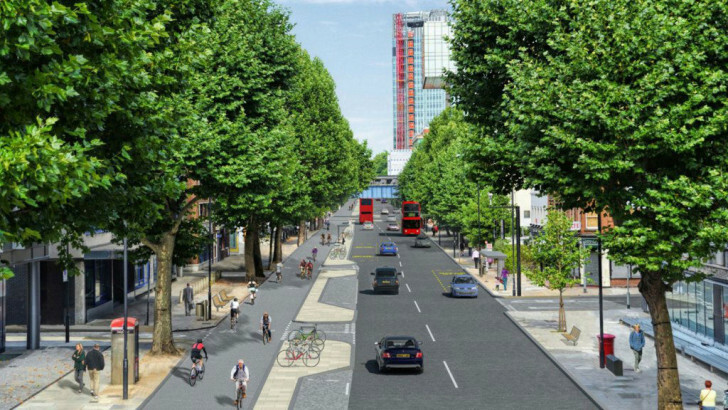 Artist’s rendering of UK bicycle superhighway. Image by Transport for London. If the goal is to move more people quickly, cheaply, and sustainably – and in a manner most attractive to the workforce our region will require to remain competitive – then we must incorporate cycling as a preferred mode of transportation.